Master Electrician Practice Test - 2019 Current with Answers Explained. Take this free practice test of typical questions that may be encountered on most Master Electrician’s licensing exams. 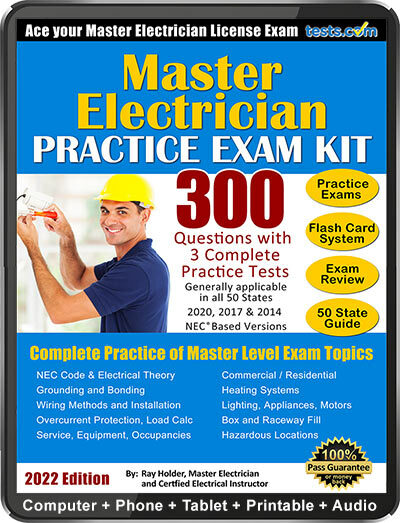 For complete practice, try the Master Electrican Practice Exam Kit with 300 questions and fully explained answers. 1. The optional method of calculation for dwelling units is reserved for ___. c. dwelling units supplied by service conductors with an ampacity of 100 amperes or greater. According to Section 220.82(A), the optional method of calculation is permitted only if the dwelling unit service-entrance conductors or feeder conductors have an ampacity of at least 100 amperes. This calculation method applies to a single dwelling unit, whether it is a separate building or located in a multifamily dwelling. It applies to dwellings served by a 120/240- volt, single phase system or a 208Y/120- volt, 3-phase system. Generally, the optional calculation method provides an easier and less complex calculation method than the standard (general) method for computing the total demand load for feeders and service-entrance conductors. 2. When calculating the service-entrance conductors of a farm where all the buildings, including the dwelling, are supplied from a common service, the second largest individual load in the group shall be calculated at _____. Due to the fact all the equipment on a farm will not be used simultaneously for an extended length of time, it is permitted to apply the demand factors shown in Table 220.103 when calculating the farm service-entrance conductors. This table shows the second largest individual load may be calculated at 75%. 3. The entire area of a service pit located in a commercial major repair garage that is not provided with mechanical ventilation is classified as a _____ location. Table 511.3(C) indicates where mechanical ventilation is not provided in the below floor level service pit of a major repair garage it shall be a Class I, Division 1 location. The Class I, Division 1 location below grade extends from the floor of the pit to the service area floor level. 4. The MAXIMUM distance conduit seals are permitted to be installed from an enclosure that houses devices that produces arcs or high-temperatures in a Class I, Division 1 location is _____. The requirements for the location of conduit seals are to prevent an explosion from traveling through the conduit to another enclosure and to minimize the passage of gases or vapors from hazardous locations to nonhazardous locations. In Class 1, Division 1 locations, if the conduit enters an enclosure that contains arcing or high-temperature equipment, as required by Section 501.15(A)(1), conduit seals shall be installed within 18 inches of the enclosure. 5. Where three (3) switches are grouped or ganged in an outlet box without permanent barriers, the voltage between the adjacent switches shall NOT exceed _____. As addressed in Section 404.8(B), permanent barriers are required between switches grouped in a box where the voltage exceeds 300 volts between the switches. Barriers are required between switches that are ganged in a box and used to switch 277-volt luminaires on 480Y/277-volt systems where two or more phase conductors enter the box. The barriers are required between the switches fed from two different phases of this system because the voltage between the phase conductors would be 480 volts and would exceed the 300-volt limit. 6. In order to determine the adequate size of a junction box containing size 4 AWG THWN copper conductors, the volume allowance, in cubic inches, required per conductor is _____. For the purpose of determining box size and fill, Table 314.16(B) shows the volume allowance, in cubic inches, required per conductor from sizes 18 AWG to 6 AWG. However, when sizing pull and junction boxes containing conductors of size 4 AWG and larger, the box dimension is to be calculated based on the diameter of the raceways entering the enclosure and the rules specified in Section 314.28 are to be applied. 7. Given: You are to install an underground run of trade size 2 in. Schedule 40 PVC conduit containing 120/240-volt, single-phase service-entrance conductors supplying a one-family dwelling. The PVC will not cross under any public streets, roads, driveways or alleys. The conduit is to have a burial depth of at LEAST _____ from final grade. Column 3 of Table 300.5, shows the PVC conduit to have a permitted burial depth of not less than 18 inches from final grade, where given the conditions specified in the question. 8. Where an eye-bolt is provided as a means of attachment of 120/240-volt, single-phase residential service-drop conductors, in no case shall this point of attachment be less than _____ above finished grade. The intent of Section 230.26, requiring the point of attachment of overhead service-drop conductors to be not less than 10 feet, is to prevent inadvertent contact with the conductors by persons, which may cause a shock hazard or electrocution and prevent physical damage to the conductors. 9. Given: You are to install four (4) size 350 kcmil THWN copper conductors in a run of rigid metal conduit (RMC). What is the MINIMUM trade size RMC required to enclose the conductors for this installation? When electrical conduit or tubing enclose conductors of the same size, with the same type of insulation, where the raceway is more than 24 inches in length, Tables C.1 through C.12(A) of Annex C are permitted to be used when determining the maximum number of conductors permitted in the raceways. Table C.9 in this Annex indicates a trade size 3 in. RMC is required to enclose four (4) size 350 kcmil THWN copper conductors. 10. Where size 2 AWG THWN/THHN copper conductors, protected by a 100 ampere rated circuit breaker, are enclosed in a Schedule 40 PVC conduit to supply an air-conditioning unit, what is the MINIMUM size copper equipment grounding conductor required for this installation? The general requirement for selecting the minimum size equipment grounding conductor is to select directly from Table 250.122 based on the rating or setting of the feeder or branch circuit overcurrent protective device(s). In this situation, the circuit breaker has a rating of 100 amperes, therefore a minimum size 8 AWG copper equipment grounding conductor is required to be routed with the air-conditioning unit supply conductors. 11. As a general rule, switches not over 1,000-volts containing fuses and circuit breakers shall be readily accessible and installed so that the center of the grip of the operating handle of the switch or circuit breaker, when in its highest position, is not more than _____ above the floor more working platform. b. 6 ft., 6 in. c. 6 ft., 7 in. Part II of Article 240 provides the general requirements for overcurrent protection and overcurrent protection devices not over 1,000-volts. Section 240.24(A) explains, as a general rule, switches containing overcurrent devices are to be readily accessible and installed so that the center of the grip of the operating handle of the switch or circuit breaker, when in its highest position, is not more than 6 ft., 7 in. This text parallels the requirement of Section 404.8(A), which applies to all switches and circuit breakers used as switches. 12. Underground service conductors of not over 1,000-volts that are not encased in concrete and that are buried 18 inches or more below grade, shall have their location identified by a warning ribbon that is placed in the trench at least _____ above the underground installation. Section 300.5(D)(3) specifies underground service conductors that are not encased in concrete and that are buried 18 inches or more below grade shall have their location identified by a warning ribbon placed at least 12 in. above the conductors. The warning ribbon reduces the risk of an accident, such as electrocution or an arc-flash incident during excavation near underground service conductors that are not encased in concrete, because these circuits are not protected from short circuit and overload. 13. Where the sole support of an outdoor installed Type FS box that contains devices or supports luminaires is two (2) underground buried threaded intermediate metal conduits (IMC) or rigid metal conduits (RMC) that emerge from ground, the NEC requires the box to be no more than _____ from the point where the conduit emerges from the ground. Part II of Article 314 covers the use and support of boxes such as FS and FD. Section 314.23(F) verifies in order to ensure adequate support of the FS box, it shall be supported by two (2) or more conduits threaded into the box and shall be secured within 18 inches of the box. 14. As a general rule regarding solar photovoltaic (PV) systems, supply-side conductor connections for PV systems must terminate in an overcurrent protection device that's within no more than ___ of the point of interconnection to the local electric utility. Article 705 establishes the requirements for interconnecting power production equipment, such as solar photovoltaic (PV) systems, that operate in parallel with a utility supplied service. As per Section 705.31, overcurrent protection for electric power production sources like PV systems are permitted to be connected on the supply side and within 10 feet of the service disconnecting means. 15. Calculate the minimum demand load, in amperes, on the ungrounded service-entrance conductors for a recreational vehicle park that has 28 RV sites all with 50-ampere outlets at each RV site. Supply system is single-phase, 120/240 volts. The provisions of Article 551 cover the electrical installations within a recreational vehicle park. As noted in Section 551.73, the calculated load for electrical services and feeders within a recreational vehicle park are to be calculated on the basis of not less than 12,000 volt-amperes per RV site equipped with 50-ampere, 208Y/120-volt or 120/240-volt supply facilities. The demand factors shown in Table 551.73(A) are the permitted allowable demand factors that may be applied when calculating the load for services and feeders in a RV park. Since the RV park has 28 sites the demand factor is 42%. Note - The RV park needs a 600-ampere rated service. 16. Conduit seals shall be installed at no more than _____ from the entrance of an enclosure that contains arcing or sparking equipment or only splices, taps or terminals where located in Class I, Division 1 hazardous locations. Article 501 address the mandates for electrical equipment and wiring for all voltages in Zones 0, 1, and 2 hazardous (classified) locations where fire or explosion hazards may exist due to the presence of flammable gases, liquids, or vapors. Section 501.15(A)(1)(2) explains the conduit seal shall be installed within 18 inches from an enclosure that contains spark-producing devices where located in Class I Division 1 locations. Conduit seals are to prevent an explosion from traveling through the conduit and minimize the passage of gases or vapors from hazardous to non-hazardous locations. It is practically impossible to make threaded conduit joints gastight. The conduit seal is intended to prevent the passage of flammable liquids, gases or vapors that can exist in Class I, Division 1 locations. 17. When building a temporary service at a construction site _____ receptacles must be GFCI protected. The provisions included in Article 590 applies to any temporary installation whether it is at a construction site, retail mall parking lot, or a local art and crafts fair in a previously unoccupied open lot or field. Section 590.6(A)(1) requires all 125-volt, 15- 20- and 30-ampere receptacle outlets to be provided with GFCI protection when not part of the permanent wiring within a building or structure. Section 590.6(B) indicates other outlets for temporary installations used to supply temporary power to equipment used by personnel during construction is to be provided with GFCI protection. Therefore, the 250-volt receptacles are to have GFCI protection also. This GFCI protection for the temporary installed receptacles is intended to protect personnel from shock hazards that may be encountered during construction or maintenance of equipment. 18. Where it is necessary to install more than one (1) ground rod used as a grounding electrode, the ground rods shall be spaced not less than _____ apart. Part III of Article 250 addresses the requirements for grounding of electrical systems. To ensure an adequate grounding electrode system, many times the grounding electrode system may consist of multiple driven electrodes (ground rods) rather than reliance on a single driven ground rod. Section 250.53(A)(3) explains when multiple electrodes are used, each electrode of the grounding system shall not be less than six (6) feet apart. This practice is very common when encountering sandy soil conditions. 19. Where a transformer supplies a single-phase, 120/240-volt, 600 ampere service, the transformer should have a kVA rating of at least _____. To solve this problem first find the VA rating. The transformer should have a rating of 150 kVA. 20. Metal conduit installed in indoor wet locations must have a minimum airspace clearance of _____ between the conduit and the wall or supporting surface. Article 300 introduces general requirements for wiring methods and materials. Section 330.6 points out where metal conduit is installed in indoor wet locations such as dairies, laundries, and car washes, metal conduit is to be mounted so that here is at least 1/4 in. airspace between the metal conduit and the supporting surface. The purpose of this rule is to prevent the accumulation of debris between the conduit and the mounting surface and help to prevent the conduit from rusting.